Three Thursdays ago, Linda and I made plans for dinner at Marea, Chef Michael White's coastal Italian seafood venture with restauranteur, Chris Cannon. This is their third collaboration together, embodying the influences of ingredients from the four bodies of water surrounding the peninsula of Italy. As Marea's menu reads like "a study of the sea", its fish is "sourced from both the Mediterranean and waters worldwide", aiming to add to the restaurant's authenticity. I love the cerulean blue used in its restaurant awnings outside as well as on its business cards. Very suggestive of the sea! 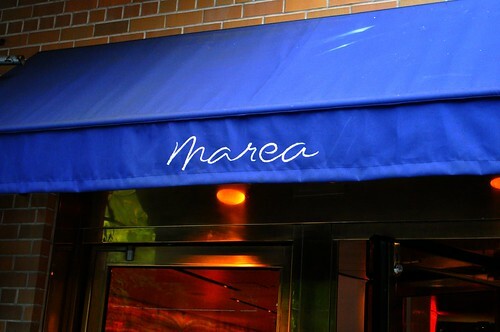 I had originally heard about Marea from last year's James Beard Foundation award nominations. 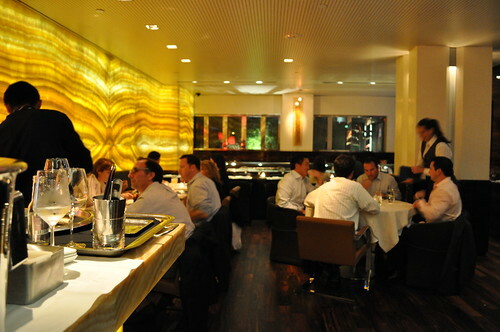 It was nominated (subsequently winning) within the Best New Restaurant category, for which the award is given to "a restaurant opened in 2009 that already displays excellence in food, beverage, and services and is likely to have a significant impact on the industry in years to come". 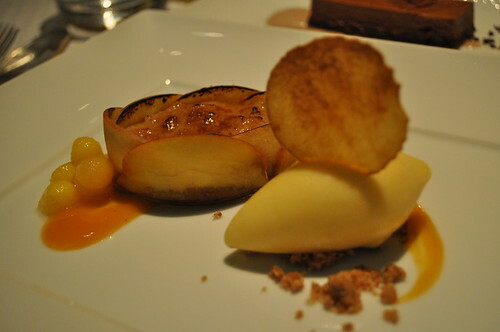 Chef Michael White was also nominated within the Best Chef: New York City category, citing Marea as well. I figured there might be something to explore and taste, so I told Linda about it, and she was in! Now, having had the MICHELIN inspectors announce that Marea has earned its second MICHELIN star (note this happened after our visit), it sounds like the restaurant is movin' on up in the foodie world! Now, having had the MICHELIN inspectors announce that Marea has earned its second MICHELIN star (note this was announced a couple weeks after our visit), it sounds like the restaurant is movin' on up in the food world! How might you ask, did we get a reservation, only with less than a weeks' notice? Easy! As I've learned from the reservation pro (aka Linda), many restaurants serve its full menu at the bar (as seen in our adventure at Maialino). I checked Marea’s website to see if there was dining available at the bar—somewhere, it briefly mentioned that there was. Just to make sure, I called the maître d’ and inquired whether the restaurant offered dining at the bar, which she confirmed it did. She did also mention the restaurant’s policy regarding bar room dining was “first come, first serve”. Not a problem at all, as Linda and I planned for dinner around 6:30 PM. Cocktail menu at Marea. I decided on the Marea cocktail hoping it was some kind of signature drink concoction of the restaurant, and also because I usually like any kind of passion fruit twist on a cocktail. 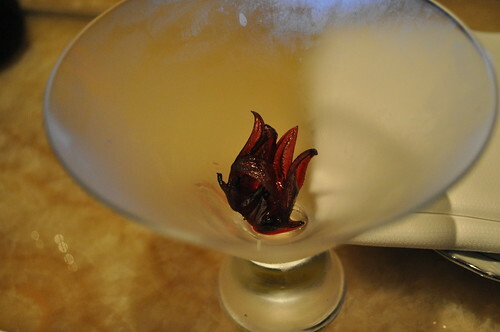 Hibiscus placed in my glass in the Marea cocktail I ordered. 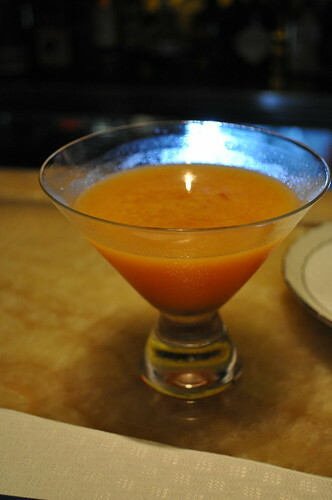 The Marea cocktail consisted of Nardini grappa bianca (traditional-style grappa that has a fruity flavor with citrus-oil and fig aromas), acqua di cedro (a citron-infused liqueur), passion fruit, and hibiscus. This was REALLY good. The only thing I couldn't put my finger on was there was a slight chocolate-y / sambuca-like aftertaste--it may have been the passion fruit. A little bizarre if I do say so myself, but great cocktail nevertheless! 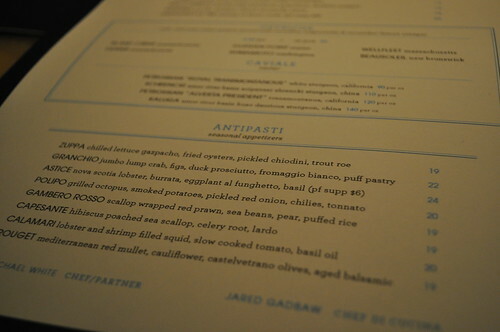 I noticed the menu is laid out similarly to the one at Maialino. The combination of black text on bone-colored paper with blue as an auxiliary color. Inside Marea. I love the understated elegance of the restaurant's space. It reminds me of a seafood brasserie I've been to a few times in SoHo called Lure Fishbar. As Frank Bruni put so well, Lure's décor "cunningly evokes the interior of a supersize yacht". While Marea may not blatantly scream yacht, it somehow suggests a sophisticated maritime and nautical feel, which is fitting for its coastal cuisine offerings. It might be the subdued earth tones against the dark hardwood that creates that effect. Notice the curved glass towards the back--it's actually a raw bar where patrons can sit and dine and admire the crudo al taglio (Italian for "raw cut") seafood. Before I get into what we ate, etc., I wanted to delve into explaining what a traditional Italian menu structure is like. The structure consists of four "dish courses"--I'm excluding any apertivos or digestivos. The first course is the antipasto, literally Italian for "before the meal, which is usually a cold or hot appetizer (seen below as granchio and astice). This course is followed by the primo, Italian for "first course", consisting of a hot dish, typically a pasta, risotto, polenta, gnocchi, or soup. This is the main source of carbohydrates during the course of the entire meal. After the primo is the secondo, Italian for "second course", the main dish consisting of seafood or meat. Many times, the secondo is paired with a contorno (literally in Italian for "contour", which I extend to be a "contour" surrounding a dish), a side dish consisting of a salad or cooked vegetables. The dolce (Italian for "sweet") is the last dish, punctuating the entire meal--the dessert. As you can see from the rest of this post, Linda and I skipped the secondo, making our primo our main dish for the night, below. 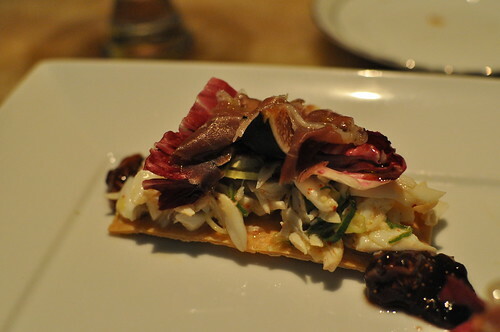 My first course, an antipasta, was the granchio (Italian for "crab"), which had jumbo lump crab served with figs, duck prosciutto atop, fromaggio bianco, and puff pastry at the bottom. I was a bit apprehensive about the fromaggio bianco, because as you know, cheese and I don’t usually see eye-to-eye in most instances. However, I figured the lovely combination of figs (I’m a sucker for seedy fruits of the like—strawberries, kiwi, etc. ), duck (in prosciutto form, no less! ), and lump crab would more than compensate for some measly cheese. And folks, Chef Michael White did not disappoint! The cold, sea-freshness of the crab and the saltiness of the thin slices of cured duck together with the fresh fig preserves served for a great starter dish. The presentation of the puff pastry was unexpected. I imagined the entire dish to be enveloped somehow in puff pastry “purse”, like a quiche. As you can see in the photograph above, the bottom layer of the dish was the puff pastry, in rectangular form, the presentation typical for canapés--pieces of puff pastry served with a savory topping (in this case, the combination of crab, figs, and duck—very savory, indeed). What I found to be interesting is that canapé is French for “couch”, which can be figuratively extended in the sense that the puff pastry is the “couch” on which to place “toppings”. On another note, the fromaggio cheese was served on the side, so no issues there! 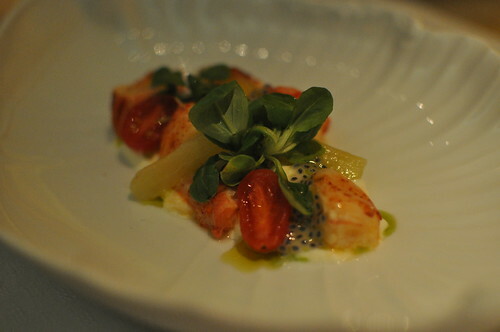 Linda went with the astice (Italian for "lobster"), which was Nova Scotia lobster with burrata (a fresh Italian cheese made with mozzarella and cream--making for a very soft texture--usually served at room temperature), eggplant al funghetto, and basil. Lobster was well-prepared—perfectly tender, served cold. I love the colors presented in this dish also--very fresh and clean. 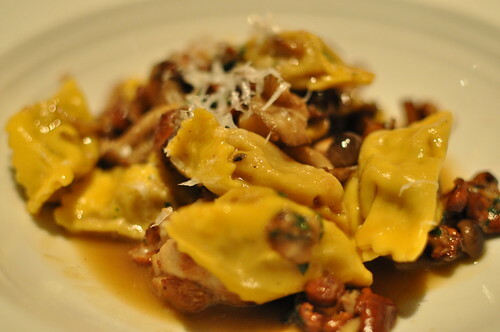 I think I've been on an agnolotti kick having since been to Maialino as I couldn't resist ordering the agnolotti, which had veal ravioli, sweetbreads, and funghi. This was from the pasta fatta in casa (i.e., homemade pasta--subtitled in the menu as "pasta made by hand in house") section of the menu, from the category altre pasta (i.e., other pasta, which differentiates from its primi di mare (i.e., first course subdivision of seafood). Very hearty ingredients (resonating fall/winter flavors) that made for a very richly tasting pasta dish. I always look forward to seeing veal, sweetbreads, and mushrooms in any dish--so when they're combined so nicely in a dish like this, what's there not to like? I wasn't disappointed, but I wasn't overwhelmingly wow-ed, either. I think my issue here is that I should have ordered a dish with seafood as an ingredient at an Italian restaurant specializing in coastal Italian cuisine (I compensated for this during my subsequent visit a couple weeks later--post to follow soon)! Linda had the gramigna with housemade bacala (a salted cod) and fave e cicoria (beans and chicory). 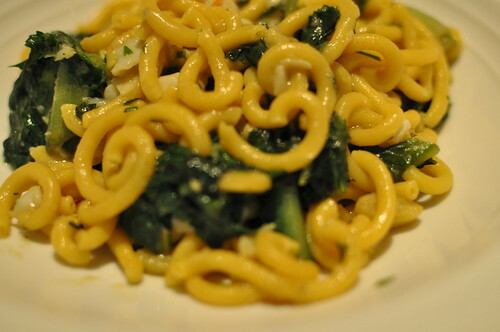 Gramigna is a pasta variety that is a thin, short, curled strand of pasta. I found the bite I had to be quite flavorful, with a nice amount of saltiness to match. Very hearty dish also that need not include any hearty red meats, which is refreshing to taste. 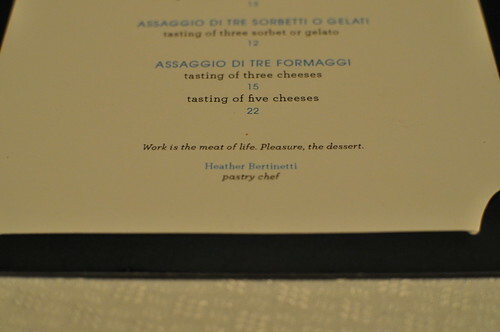 What a nice touch to the dolci menu--Work is the meat of life. Pleasure, the dessert. Very clever! I ordered the gianduja with cocoa nib crema, hazelnuts, chocolate, and fior di latte gelato. 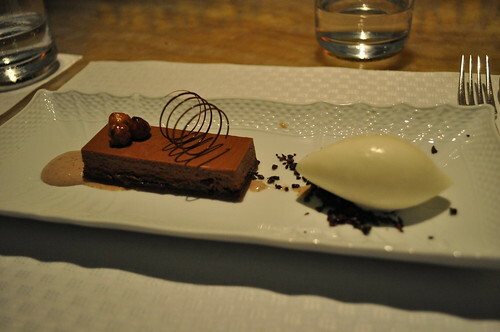 If I ever have issues deciding which dessert to select from a menu, chances are if there are hazelnuts in the picture, that will be my final answer, usually without question. Also, gianduja is a European-style of chocolate made from chocolate and nut paste. Most commonly used paste is made from hazelnut, but almond paste can also be used, so the actual hazelnuts added a fresh touch. The cocoa nibs added a nice crunch to the gelato and gianduja combination. Very delightful dessert! Linda had the budino di riso--a spiced rice pudding with slices of stone fruit, amaretti crumble, and plum sorbet. The poached stone fruits were layered in a wall around the spiced rice pudding. I love the added spice to the rice pudding, kind of giving an autumnal feel to the dessert. For those who may find chocolate too rich in the desserts of fine dining, this is a great non-chocolate dessert to have. Linda's a big fan of rice pudding, so this was right up her alley! Findings: I really like the classic menu structure at Marea--it certainly adds to the restaurant's authenticity of going back to regional Italian cuisine. The restaurant's ambiance is also something I really enjoyed--I enjoy things more when they're understated, subtle, and minimalist in nature. The same goes for the restaurant's dishes--very flavorful with simplicity and looking to classical regional rudimentary cooking, which isn't to say the creativity isn't there. The granchia is a great example--presentation and combination wise! 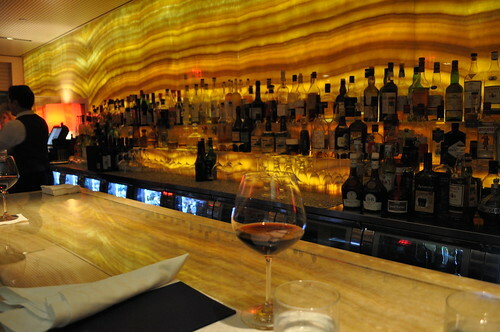 I really enjoyed our experience eating at the bar--it made for great conversation, without feeling too stuffy or overdone. I really recommend ordering seafood-focused dishes (as it is the restaurant's focus/specialty)--not to say that carne is poorly executed. I think it's kind of what Marcus said in his Argo Tea post: that ordering non-seafood items at a seafood restaurant is "almost as sad as watching the crazed, misguided man who sits down at a Japanese sushi restaurant intending to order a hamburger." No worries--I learned my lesson. Please look for my upcoming post about my most recent visit to Marea and the primo I ordered to mark the best of both worlds of land and sea. Nevertheless, great conversation mixed with Italian red wine and solid Italian cuisine makes Marea a lovely place to catch up with friends and nourish our stomachs well. 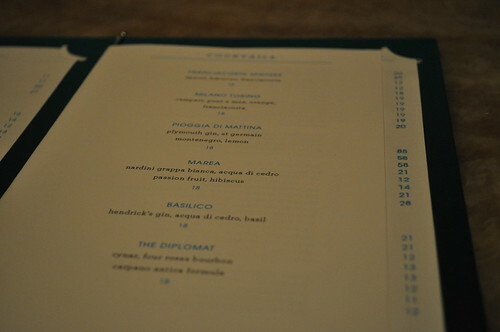 Price point: $18 for the cocktail; $22-24 for each antipasta; $27-29 for each primo/pasta fatta in casa; $13-14 for each dolce.